I am now officially 24 years old! We had an argument going earlier of whether or not 24 is early twenties or mid-twenties. I think it’s still your early twenties, right? Right. After breakfast, we went up to my parents’ room where they gave me a few gifts. 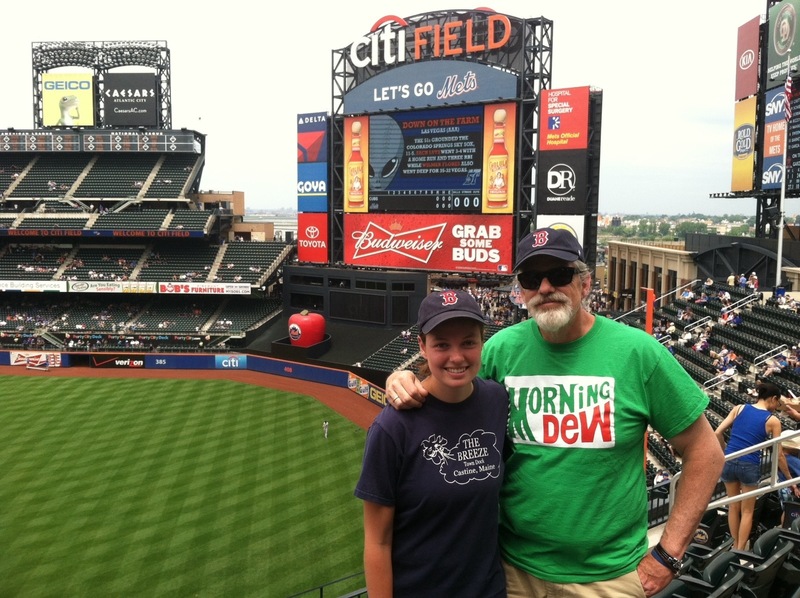 Among the gifts was a new Red Sox hat, which I proudly wore to the Mets game. Usually, I’m not one of those people who wears the hat of another team that’s not playing to the game, but since I won’t be able to wear the hat again until August, I figured it would be okay. We drove into Queens after a little gift opening for the Father’s Day Mets vs. Cubs game. 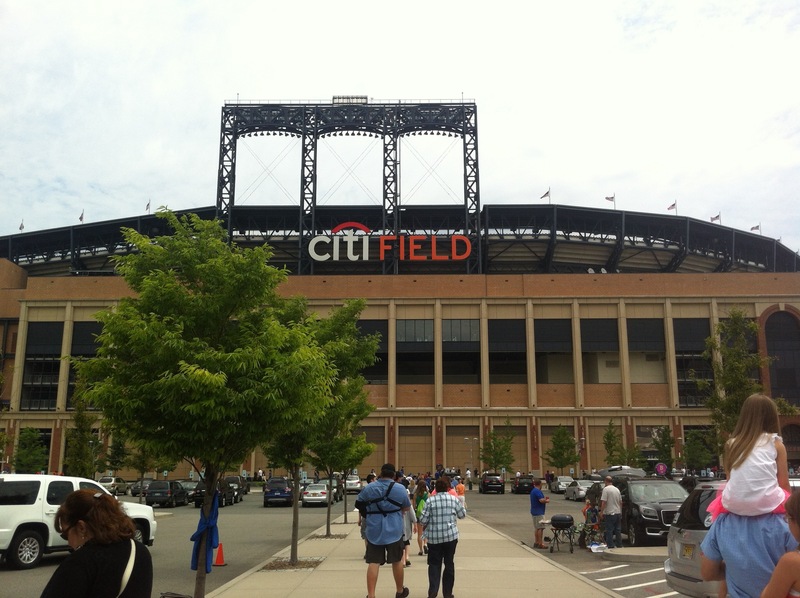 This was our first time to Citi Field, so we were all looking forward to the afternoon game. It was hot today as we sat in the right field section in the sun, but we had a good time enjoying some baseball. There’s nothing like a baseball game in New York on Father’s Day. Americana at its finest. After our afternoon in Queens, we headed up to Yonkers to buy a few things at REI. I bought a Smartwool shirt because I had heard great things from other thru-hikers about wool hiking shirts. My synthetic Under Armour shirt smells horrible now that the weather has warmed up. Obviously, I’m used to smelling bad, but I figured the shirt I’ve used the past few months is now engrained with sweat and a new Smartwool shirt wouldn’t hurt. It’s interesting now that I think about the fact that my wardrobe has changed almost entirely from when we began our hike. You learn as you go I suppose. I also bought bug netting for my head. I think this is something that will be very useful as we head farther north. At $20 and at such a light weight, I couldn’t pass it up. Miles picked up some bug netting as well. We’ll mainly use it at camp when the bugs are unbearable. The shopping center was a little overwhelming with the hoards of people walking around. But Miles and I weren’t the only ones overwhelmed, my parents felt the same way. All of the restaurants were packed, so we decided to head farther north for dinner. We actually ended up eating at an Italian restaurant near where we’ll be staying with friends in a few days in New York. I got to pick where we ate tonight, so of course, I picked an Italian place. My dad and I are both fans of Italian food, so it was a perfect place for our dual birthday/Father’s Day celebration. Afterwards, we had a quick visit with Meg, Matt, and their daughters before the girls went to bed. We didn’t stay long since we were all tired, but we’ll be back there in a few days to spend more time with them, so we’re really excited about that. We are beat after a long day of celebrations. If you think hiking in the hot sun wears you out, try sitting at a baseball game in the roasting sun. 😉 I’m going to eat a piece of chocolate cake, a birthday tradition for many years, and then rest up for more hiking tomorrow. It’s not very often that my birthday and Father’s Day fall on the same day, once every seven years, so I’m really glad that even though we were hiking the AT, I still had the chance to spend the day with my dad. I’ve got two really awesome parents and I feel pretty lucky to be their daughter. I have to tell you, you share your birthday with my daughter who is 18 today and as a dad we could not be more proud of our independent, confident and beautiful daughters no matter what they choose to pursue. God Bless you on your birthday! Happy Bday!!! Love the last line!!! happy belated birthday from Detroit Airport- Whippee. Well, 24 is not the middle of the 20’s, however it might be considered “mid”. We don’t tend to say 84 is the “low 80’s” now do we.? I owe you a Birhday present – Perhaps something for your place, when you’re not homeless. Bug nets are as effective as they are wierd looking. My sister-in-law is walking behind you, SAS, so I have been reading your blog to see what she has to look forward to (By the way she is by herself at 60). I have to comment on today (sorry a little behind in reading), because I love the statement you will tell your children you where … At 24. That is a running joke in my family too.